Full Stave worktops give an undeniable hint of luxury to a kitchen. The clear run of wood, with hand matched planks, let the natural grain take pride of place. 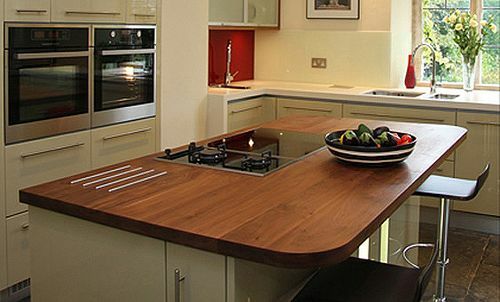 Worktops which are made from single long boards of wood are called full stave worktops. The total number of staves that must be joined together will vary according to the width of the boards used; ours are typically between 100 and 200 millimeters. This wide planked worktop combined with full stave means a stunning uninterrupted run of timber. This lets the grain of the wood shine through and provides a beautiful finished product. We hand select all our boards and colour match them. This is what gives the distinctive and exclusive Bordercraft look to our worktops. Handmade quality that is clear to see. A full width and full stave worktop is the best way to see the natural beauty of wood. That is why we have specialised in this style of worktop since we started in 1972. We responsibly select the best quality timber from the best plantations and then handcraft every worktop with care and attention to detail. We believe this approach gives our customers the best quality worktop available and our testimonials back that up. We manufacture wide planked hardwood worktops and furniture using the finest timbers selected by true craftsmen.